There is no single correct algorithm to calculate a continuous contract. It depends on trader's needs which algorithm should be chosen. The simplest and the most common method is spot (front) month continuous which takes always the nearest expiration contract and moves to the next one after expiration (contracts rolling). Chart below shows example of spot month continuous split data. There are many factors which can generate a difference in the price of different expiration contracts (for example contango, backwardation, crop seasons, etc.). It can result in gap between the old contract and the new contract price. These gaps can be significant and data can appear disjointed (blue circle on the chart above shows gap when two contracts are joined). How to eliminate gaps? When rolling contracts backwards, we can measure every roll gap and adjust all previous prices up or down based on gap direction. Chart below shows example of spot month continuous back adjusted data (blue circle shows gap between two contracts eliminated). There are more ways how roll and adjust data. Instead of expiration, we can follow the market and roll contracts based on volume or open interest. To eliminated gaps, we can instead of back adjust data use opposite direction and forward adjust data. Some data vendors can have their own proprietary algorithms for continuous data calculations. But this is out of the scope of this article. Let's now compare our two basics methods. 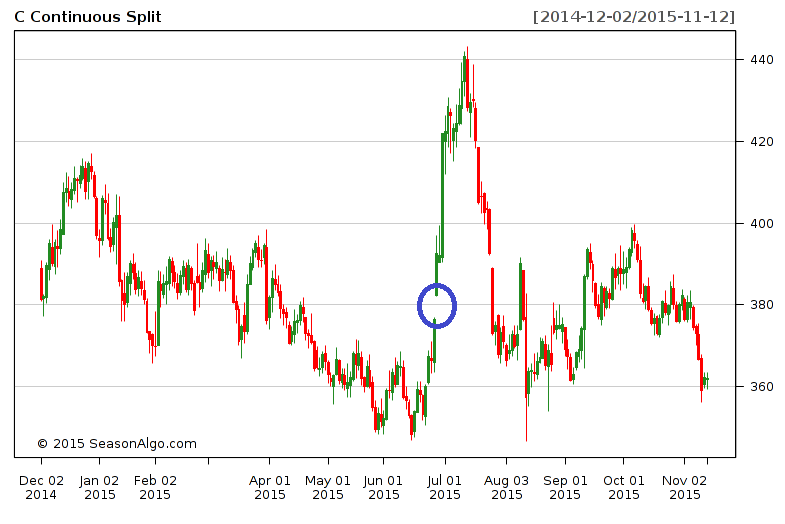 The split contract shows where futures prices have traded in the past. It gives you bigger picture and a good overview of whether current futures prices are trading high or low compared to the history. Split data show price levels in a futures market. As a disadvantage, they show you fake price movements (roll price gaps) which can affect indicator calculations (for example moving average) and automated trading systems - ATS (gaps will be calculated in profit/loss). 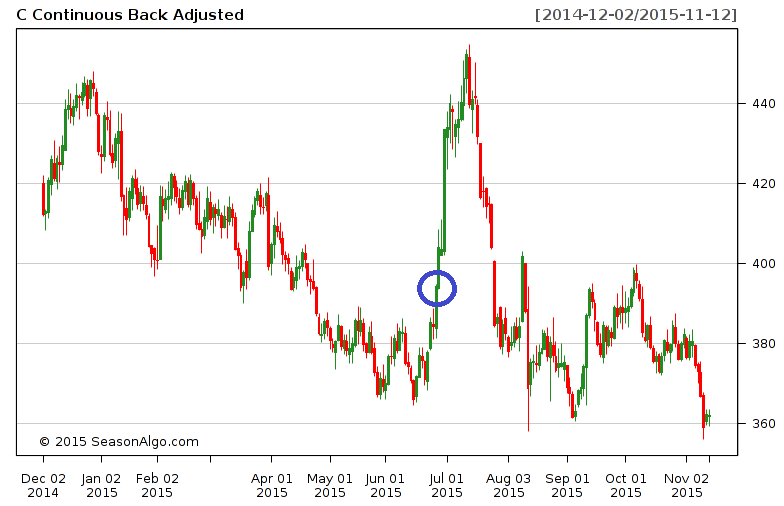 Back Adjusted data show correct price movements, so they can be used for indicators and ATS. As a disadvantage, they show fake price levels (prices which were never traded in the history). If you are that type of trader who analyzes outright futures legs (usually what's front leg is doing), then you will find continuous data for outright futures in our Analyze => Futures section. If you use COT indicators, you can now with continuous data examine whole COT history. Seasonal analysis and trading has its own requirements for continuous data construction. When studying seasonality we are interested in specific period which repeats every year. We roll contracts (outright futures or spread) with same expiration months and change only year. 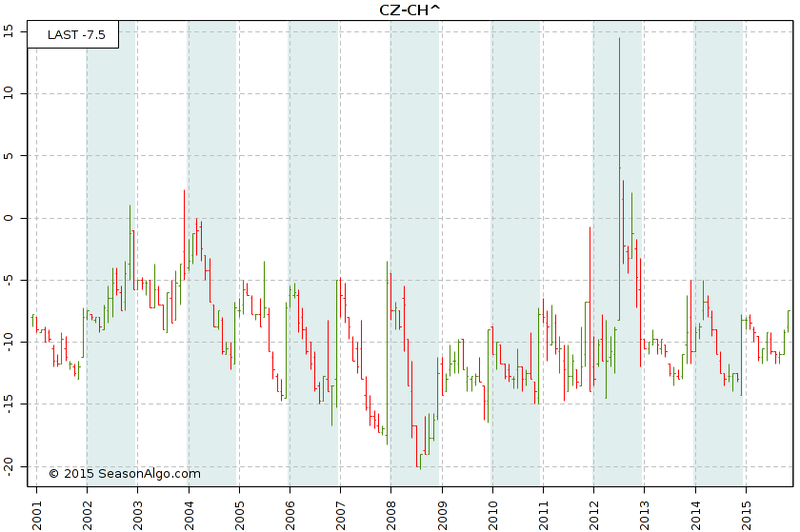 Chart below shows continuation data with yearly roll for CZ-CH^ spread (^ means front leg year +1). Spread used for data construction are CZ15-CH16, CZ14-CH15, CZ13-CH14 etc. Grey/white bars serve as spreads separator for better visualization. You will find this chart in our Analyze => Continuation section. Chart uses weekly/monthly aggregation so OHLC data can be displayed. Another useful continuation data construction for seasonal and spread trading is roll which preserves term structure. Basic principle is same as with simple continuation split roll, but we don't necessary roll nearest expiration contract and we keep specific distance. For example NG2! means rolling the second nearest expiration months. NG8! rolls the eighth expiration contract. We can of course combine data to spread for example NG2!-NG8!. Let's say current month is November and the spot contract is NGX15. 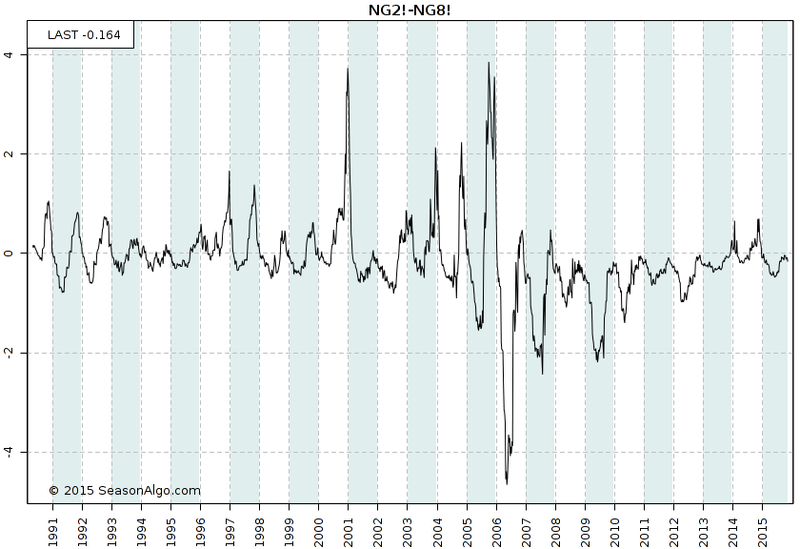 Then term structure roll uses NGF16-NGN16, NGZ15-NGM16, NGX15-NGK16 etc spread. When NGX15 expires, then current spread will be NGG16-NGQ16. What is the advantage of such continuous data construction? It can nicely show seasonal tendencies, check chart below. You will find this chart in Analyze => Continuation section and just change data type. For both types of roll, it's important to see real price levels, so it's simple split without gaps adjustment.